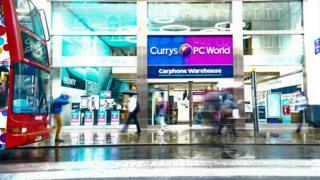 Dixons Carphone shares were down more than 3% in early afternoon trading. A spokesperson for the National Cyber Security Centre said it was "working with Dixons Carphone and other agencies to understand how this data breach has affected people in the UK and advise on mitigation measures". On the face of it, this is a very serious incident. Usually when companies report a data breach, they are very quick to reassure us that while names, email addresses and login may have been accessed, no payment information has been released. This is not the case here, with Dixons admitting that hackers got access to records of nearly six million payment cards. The good news is that nearly all of them were protected by good old chip and pin - and there is no evidence of any fraud relating to the 100,000 non-European cards which didn't have that protection. But there are still questions for Dixons Carphone to answer. Why has a hack that apparently happened nearly a year ago only been revealed now? And is there any connection to a previous data breach at Carphone in 2015? Dixons insists that it only discovered this latest hack a week ago and it has no connection with any previous incident. But the UK Information Commissioner's Office (ICO), which fined Carphone Warehouse £400,000 for the 2015 breach, will now be looking very closely at this latest failing of the merged companies. Luckily for Dixons, the incident happened before the new GDPR rules, which promise much bigger fines, came into force. "We've taken action to close off this unauthorised access and though we have currently no evidence of fraud as a result of these incidents, we are taking this extremely seriously," he added. Bryan Glick, editor in chief of Computer Weekly, told the BBC that the breach was "right up there" as one of the biggest to date involving a UK company. However, he cautioned against any panic. "If you've not heard from Dixons Carphone to warn you, the chances are you're OK," he said.